The gracefulness of the Manta Ray is truly a thing of beauty. They are a giant of the ocean and can reach a disc size of up to 7metres, averaging around 4.5 metres. Coming in at Number #2 on the Great 8 of our Great Barrier Reef’s living icons is the Manta Ray and you may have to chance to get up close and personal while snorkelling the pristine waters of Lady Musgrave Lagoon. The Manta Ray has the largest brain to body size ration of any living fish which makes them quite inquisitive around snorkellers and divers, coming up to “inspect” what you are up to. The flapping in Mantas can generate incredible amount of propulsion. A 4.5 metre Manta can travel at around 14 kilometres per hour with bursts of up to 35 kilometres per hour. You can name one as well. If you get a chance to swim with the Manta take a photo of its underbelly. No two Mantas have the same markings. If it is identified as a “new” sighting, you can name it yourself! During breeding times up to 30 males may follow only one (1) female as she leads them in a merry dance resembling something like the old Conga Line dance. She will then choose one of the males as a partner. Once she falls pregnant, the male departs and has no part in any parenting. What a big mouth you have? The Manta has a very large, forward facing mouth. This allows them to migrate across the open seas and filter feed large quantities of plankton which they swallow with their open mouths as they swim along. 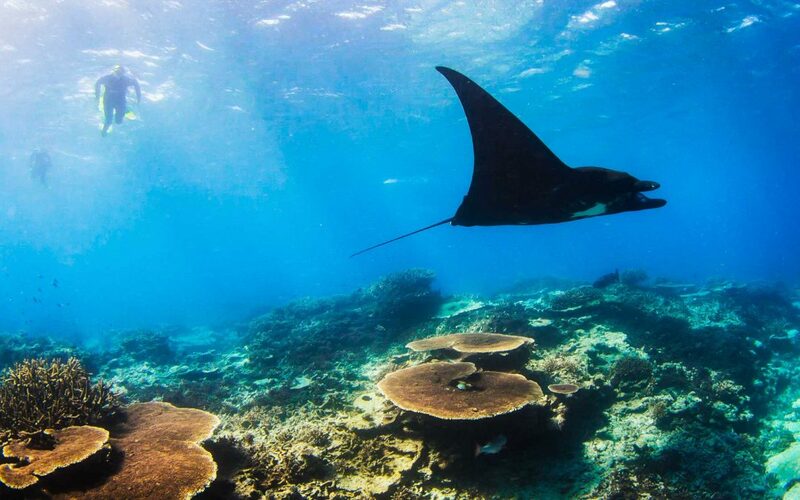 Let 1770reef help you tick the famous MANTA RAY # 2 on the Great Barrier Reef Great 8 off your bucket list!! !